Hello Friends iTimes(Bollywood News & Gossip App ) App Is A New Version Of Timespoint App. iTimes Offering 150 Points On Signup And 100 Points Per Refer You Can Earn Upto 1500 Points Worth rs . 150 You can easily redeem the points in Recharges So hurry guys lot this offer before it get expired . Your one-stop platform for all Bollywood News & Bollywood Gossip. itimes is India’s first Interest based Social Network. Decide what topics interest you and itimes will help you stay updated. Download The Itimes App From This Link. complete The Signup Process ,You Will Get 150 Bonus Points . 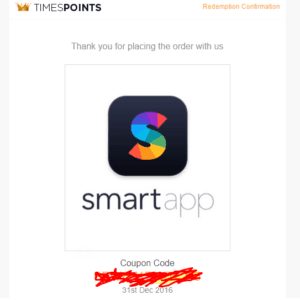 You Need 300 points to redeem smartapp voucher or more for more amount . Go to refer And Earn From Account Info . Copy your refer Link And Share It With your friends . For Each Friends Signup You Will get 100 Points . you will be land to Redeem option . Select The Smartapp Rs. 25 Voucher . You will receive the voucher On Your Mail.